The Loft Theatre presents Magic Fusion, starring world-class magicians from around the world. Showtimes are: 7:00p seven days a week, with additional shows on Thursdays, Fridays(* Friday 9:00 Magic After Dark is Adults (18+) ONLY), and Saturdays at 9:00p and on Sunday at 4:30p. The show is approximately 75 minutes long, and appropriate for all ages. 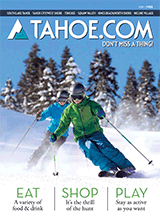 During busy seasons we may add shows, so please check our website at http://www.thelofttahoe.com for the most up-to-date schedule.